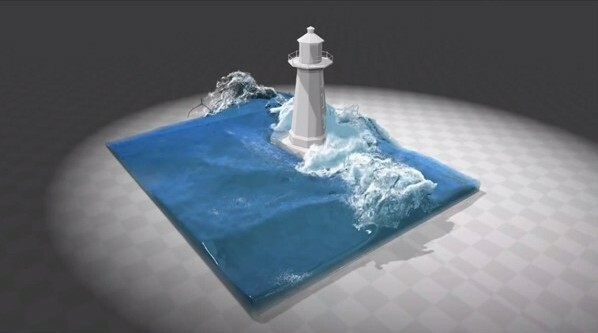 Two physics programmers at NVIDIA – Miles Macklin (blog here) and Matthias Müller-Fischer – have written a paper, accepted for presentation at SIGGRAPH 2013, called Position Based Fluids (PBF) that explains the algorithm and inner workings of the new fluid simulation technology. The SIGGRAPH submission video can be viewed at the very bottom of this article. Directly below is a supplemental video which demonstrates the further work achieved since submission, enabling spray and foam effects. In fluid simulation, enforcing incompressibility is crucial for realism; it is also computationally expensive. Recent work has improved efficiency, but still requires time-steps that are impractical for real-time applications. (…) We incorporate an artificial pressure term that improves particle distribution, creates surface tension, and lowers the neighbourhood requirements of traditional SPH. Finally, we address the issue of energy loss by applying vorticity confinement as a velocity post process. I am a graduate of the Bachelor of Interactive Entertainment (w/ major in Games Design) course at Qantm College, Sydney.